For co-op students, a college education extends well beyond the classroom. Now in its third year, the co-op program at the Fred DeMatteis School of Engineering and Applied Science offers students the opportunity to gain paid, hands-on experience working in a field related to their major for a period of six to eight months before they graduate. As of Spring 2018, the program has placed more than 90 students at technology firms nationwide. “More than 80 percent of the students who’ve graduated from the program have received job offers from their co-op companies,” said Program Director Philip Coniglio. “The co-op gives our students exposure to real-world engineering and computer science work and a competitive edge to kick start their careers,” Coniglio said. Industrial engineering major Michael Spencer, ’16 was among the first co-op students. 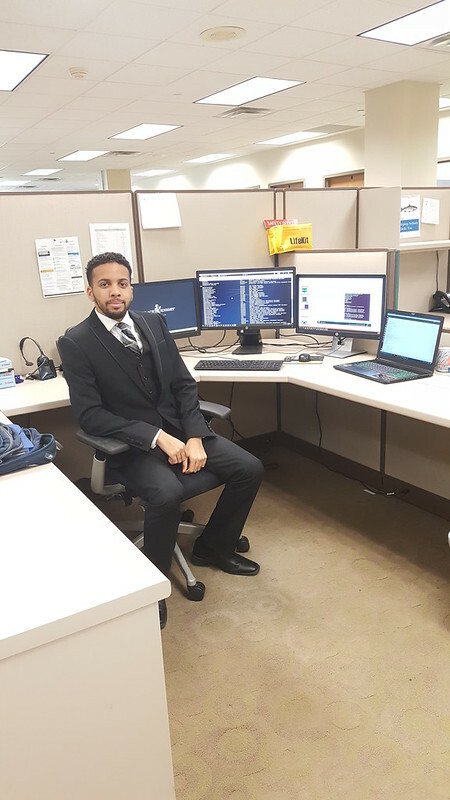 After working at Black Knight Financial Services in Los Angeles for seven months during his junior year, he was hired as a data analyst at Property Insight, a division of Black Knight, immediately after graduation. “I’ve been able to hit the ground running and take advantage of opportunities that normally would not have been available to me if I hadn’t done the co-op,” Spencer said. The co-op is a competitive program open to all undergraduate and graduate students in engineering and computer science. Undergraduates must have a GPA of at least 3.0 and have completed the first semester of their junior year. Graduate students need a GPA of 3.2 or higher. Students create a professional resume with assistance from Hofstra’s Career Center, and may go through several rounds of interviews before receiving an offer of from a co-op partner. Co-op students are not enrolled in regular classes during their employment, so participating may push their graduation back a semester. "...nothing compares to working hands-on and having to adapt and solve real world problems." Mechanical engineering major Frank Tricouros ’19 is a co-op student at Oerlikon Metco, a global technology firm with offices in Westbury, that manufactures sprays used to coat high temperature parts in a variety of industries from automotive to aerospace. Tricouros is currently working on the development of a new pressure-fed feeder. Mihir Desai ’17 graduated with an MS in computer science and was hired for a co-op position at Contemporary Computer Services (CCSI), a Long Island based technology firm. CCSI offered Desai his current job as a web developer three months before graduation.